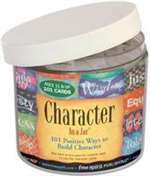 Build and reinforce positive character traits at home, in the classroom, after-school programs, youth groups, or wherever you interact with kids and teens. Inside the jar are 101 little cards (2 in. x 2 Â¾ in.) printed with words or phrases â€” Caring, Giving, Service and Sharing, Empathy, Citizenship, Cleanliness, Patience, Compassion, Tolerance, Cooperation, Reliability, Being Punctual, and many more. Use them as discussion-starters or writing prompts. Act them out, talk them over, or plan ways to live them every day. Based on What Do You Stand For? For Teens this is a simple, powerful tool for promoting character development.